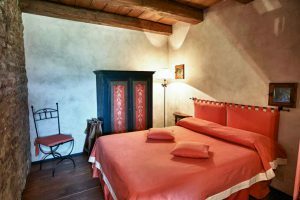 THE KNIGHT is a beautiful three-roomed apartment (81 sqm), with entrance on the second floor of the Tower. It features entrance, a large dining room with full cooking surface, living room, one bathroom and two gallery double bedrooms (one with queen size bed, the other with queen size or 2 twin beds), with AC – one above the other, with an inner wooden staircase that fit better with a family because there is no wall that guarantees total privacy. The bathroom is equipped with all the sanitary ware, included a shower. The main feature of this apartment is the position of the bedrooms inside the Tower, the stone walls, the arched Romanesque windows, the barrel vault ceiling with frescoes. There are many exposed wood beams in the apartment and tall ceilings. Furnished with 19th century antiques and elegant fabrics, it features independent heating system, colored satellite TV, telephone, WIFI, dish-washer, hair-drier and safe box; it has plenty of fluffy towels including swim towels, fine bed and household linen, cutlery, crockery and kitchenware, and parking space in the car port. 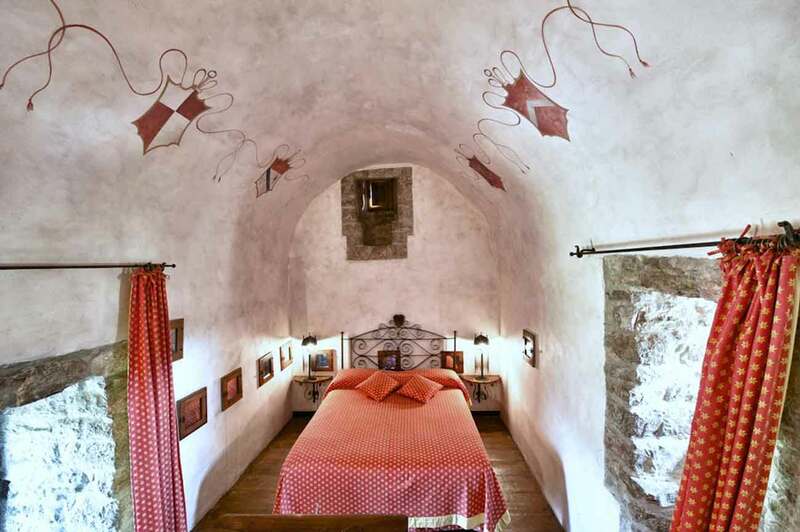 The Knight is full of light and has a wonderful view over the Tiber Valley and the surrounding woods. The living room has views from five windows so there is a great deal of light.